Anyone watching David Attenborough's programme about First Life will have seen the Moroccan people extracting the trilobite fossils and the amazing work they do on them! Buy the DVD if not! Cambrian/Devonian Trilobites from Morocco - Please remember that every single trilobite that comes from Morocco is repaired due to the nature of their extraction and so minute amounts of shell loss in places is inevitable. The rock is so hard and it needs strong hammers and even stronger people to extract them from their Devonian rock. Dynamite has been used in the past! When a cross section of a trilobite is seen, the rock is glued back together and special air tools are used to chip and blast the rock away from the trilobite and this takes hours and hours. A fine coat of fossil preservation varnish brings out the detail and helps keep them clean and free from dust for the future The amount of work that goes into these beautiful specimens is well worth it when you get them looking like these! We hope you enjoy your trilobite fossil for many years to come! Every one is unique and the positions they are found in tell us a lot about their environment and their lives. Two deposits in Morocco give rise to a Steel grey trilobite on grey/white matrix and a rarer Red ochre trilobite on rouge matrix. The Rouge ones are the collector favourites because they are the least found and much rarer. Both are similar ages. 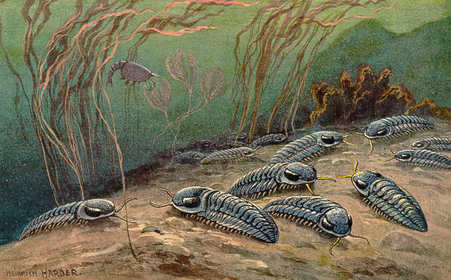 Please email us for advice regarding trilobites if you are not sure. Devonian age (Pragian) 381-391 Million years old, Atlas Mountains, Morocco. Ihandar fm. Djebel Oufatene. Devonian age (Eifilian) 381-391 Million years old, Atlas Mountains, Morocco. Emsian, Oufatene. Devonian age (Emsian) 381-391 Million years old, Atlas Mountains, Morocco. Bou Tiskaouine Fm, Taharajat, Oufatene, Ma'ader. Devonian age (Eifilian) 381-391 Million years old, Jbel Oufatene, Atlas Mountains, Morocco. Devonian age (Eifilian) 381-391 Million years old, Atlas Mountains, Morocco.